After completion of high school the next step for most students is a college degree. These new graduates are eager and excited to start a new chapter in their life. There getting ready for endless fun, looking to expand their social bubble, and looking forward to the experiences that they can reflect on. However, for most of these students, they can accumulate a lot of extra baggage. The baggage that is being referred are student loans. As of June 2010, collectively speaking, the total national student debt added up to $1.4 trillion, which overtook the credit card debt (Avery and Turner). The number is growing by the day with graduates not being able to pay. This essay will discuss the rising student debt problem, the effects it has on students, how to better manage student finances, and provide alternatives to college. With the demand for knowledge increasing by day college is a great opportunity for many and is treasured by American culture. College education can unlock new opportunities, help develop new skills and offer better careers. However, college education can be a risky endeavor. Students who spend an extensive amount of time can rack up a significant amount of student loans. According to Joseph Stiglitz “The average tuition, and room and board, at four-year colleges is just short of $22,000 a year, up from under $9,000 (adjusted for inflation) in 1980-81” (1). This statistic does not include the other finances students may encounter such as credit card bills, auto and personal expenses, and other fees. Students sometimes do not stop after a four year degree, some opt to pursue a graduate school program adding on to their debt. According to the Federal Reserve Bank of New York, (qtd in Stiglitz) “almost 13 percent of student-loan borrowers of all ages owe more than $50,000, and nearly 4 percent owe more than $100,000. These debts are beyond students’ ability to repay” (1). As a result, more and more students end up defaulting or failing to pay their loan on time. This haunting effect takes a toll on their actions in school and future. According to Pharmacists Timothy Ulbrich and Kirk Loren, “Excessive student loan debt may affect students’ career choice, diminish quality of life, negatively impact their ability to give back to their school or college and society at large, and delay progress on achieving other financial goals, such as saving for retirement” (Timothy and Loren). Paying for college can be a tricky thing to deal with and it can become a problem with students academic performance. Financial aid comes in many forms, the most common being student loans. Grants a essential money that does not have to be paid back and is provided by the government for schooling purposes. These are often difficult to obtain and as a result many students opt for loan. Students that go this route are at risk to more interest rates and hidden fees. The fact is that these student loans can play a role in how well a student does in college. Students who receive federal grants tend to enjoy their education more and take it less seriously than those who receive loans. Those taking loans feel more obligated and focused. According to Thaler (qtd. Cappelli and Shinjae) “being reminded about the costs of a purchase makes us take that purchase more seriously” (5). In terms of academic performance and grades, studies done by Peter Cappelli and Won Shin Jae suggests that “Students who receive student loans receive grades roughly 0.6 to 0.12 points lower than those receiving financial aid not in the form of loans, again other things equal and across different specifications” (30). Scholarships are another form of free money. However theses are sometimes difficult to get and depend heavily on intelligence, race, age, athleticism, and many other personal factors. In essence how well a student does dictates how much financial aid a student receives. Those that struggle are at higher risk of struggling to pay for college. Managing student debt is difficult, but not impossible. There are solutions and things that can be done to help students pay off debt. For one, it is important to establish clear communication between student and school. According to Matthew Reed and Debbie Cochrane “All students and families should have easy access to clear, consistent, and timely information about costs and outcomes for all colleges, so they can make crucial comparisons at key decision points” (24). This communication can help students avoid scams and private loan abuses. Secondly, simplify the financial aid process. Many students who apply for college are turned away from applying for financial aid because of the degree of difficulty. Studies show that “an estimated 2.3 million students were eligible for a Pell grant but did not complete the Free Application for Federal Student Aid (FAFSA) in 2007-08” (Reed and Cochrane). Lastly, increase the number of federal aid programs. This include applying for scholarships and other government funded financial aid programs such as FAFSA (Free Application for Federal Student Aid) or other grants. Some students may be tempted to apply for other money eating sources, such as a credit card. However it is best to avoid such things. Unless an individual is very meticulous and good with their money, having a credit card while in college may increase the total amount of debt owed. Another problem solving solutions to reducing student loans are attending community colleges. These colleges offer similar programs for a fraction of the tuition cost. Students can also explore different majors without spending a significant amount of money. In addition, because of living so close to home factors such as living and food expenses, homesickness, can be reduced. Budgeting can be a great way for students to pay off their debt long term. Personal finance skills are available online for free and individuals can experiment on what works for them. Although it may sound tacky, Ulbrich and Loren state that “students should be encouraged to employ any strategies that may minimize cost of living expenses such as establishing a budget, sharing books and supplies when possible, attending university-sponsored events that offer meals, carpooling to school and rotation experiences, living with one or more roommates to keep rent and utility costs down and delaying large expenses (such as purchasing a car) during school” (Ulbrich and Loren). Limiting expenses and sacrifices must be made in order to get the most out of one’s money. College can be a great way for students to progress their life. After all, it is a lifelong personal and educational investment. However, along with the great things higher educations can offer, there are some drawbacks. Just like all investments there are risks associated with going to college. Students should not feel like they are trapped in a financial agreement after graduation, but that is the grim reality. The collective total that student owe is continuously rising and this is definitely a problem that needs to be addressed. However, until policy makers can find a solution, it is up to students to provide for themselves with the little help the federal government provides. Avery, Christopher, and Sarah Turner. “Student Loans: Do College Students Borrow Too Much–Or Not Enough?.” Journal of Economic Perspectives 26.1 (2012): 165-92. The article goes to talk about the financial problems students face when leaving college. After completing an undergraduate program, students are shackled by the student loans they have accumulated over the years. The number of student debt is growing substantially everyday. The article discusses lots of statistical data that I am looking forward to use to state that my issue is a problems. The journal has been retrieved from google scholar. It was written by two authors, Christopher Avery, and Sarah Turner, both experts in the field of finance. Baum, Sandy, and Saul Schwartz. “How Much Debt Is Too Much? Defining Benchmarks for Manageable Student Debt.” College Board (2006). This report aims to serve as a financial guide helping students navigate through school. It aims to give students advice about student loans and finance. I plan to use this in my report as a solution/guide for the rising student debt problem. The report comes from google scholar. Written by Sandy Baum, Saul Schwartz, both college professors. This report was also published by College Board in 2006. Cagle, Daryl. “Student Debt.” Chicago Patch, patch.com/illinois/chicago/how-much-student-loan-debt-does-average-illinois-grad-have. This was the image that was used. This journal overviews the different types of student loan. In addition, it add what the benefits are of each, some statistical information, and the effect that these loans have on students. I used this in my for the effects of loans on students while in school. This journal was found on google scholar and was written by two university of Illinois professors Peter Cappelli and Won Shinjae. Stiglitz, Joseph E. “Student debt and the crushing of the American dream.” The New York Times, May 12th (2013). This articles talks about the continuously growing student debt problem. It adresses several key aspects such as statistics and numbers of how much the average student owes. I am using this in my article for the numbers and statistics provided. This article was found on google scholar and was written by Joseph Stiglitz Columbia University professor. Reed, Matthew, and Debbie Cochrane. “Student Debt and the Class of 2011.” Project on Student Debt (2012). This journal provides informations about studies that cover causes and solutions of student debt. The journal also mentions an effect on how college students decide their career. I am using this journal for the research and solutions provided. This article was provided by google scholar and published by two university professors. Rothstein, Jesse, and Cecilia Elena Rouse. “Constrained after college: Student loans and early-career occupational choices.” Journal of Public Economics 95.1-2 (2011): 149-163. This article explains how student debt can be a real problems when it comes to choosing majors. The potential debt theses students acquire play a role in deciding a career. I am looking forward to using this article as a cause as to why student debt is a problem. This article provides information about why students do not donate to the institution when they graduate. This journal also comes from google scholar. It is written by Jesse Rothstein ann Elena Rouse. Rothstein is a professor at University of California Berkeley and Rouse is a professor at Princeton University. Ulbrich, Timothy R., and Loren M. Kirk. 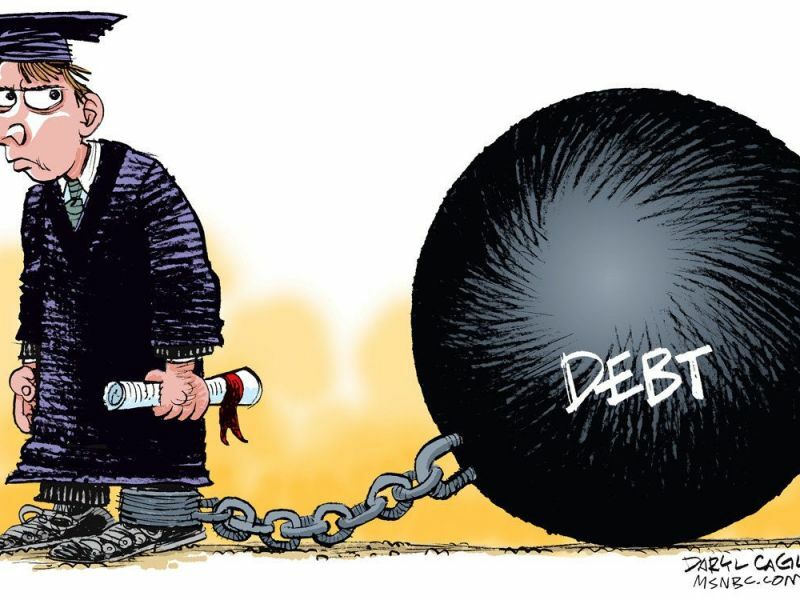 “It’s Time to Broaden the Conversation About the Student Debt Crisis Beyond Rising Tuition Costs.” American Journal of Pharmaceutical Education 81.6 (2017): 101. PMC. Web. 25 June 2018. This article provides information about graduate school debt. The journal goes into detail about the growing numbers of student debt. It also provides solutions that students can do such as budgeting to reduce the amount owed. I am using this article mostly for the solutions and possible alternatives to high expense tuition. This article was found on google scholar and was written by two Pharmacists Timothy Ulbrich and Kirk Loren. Previous Previous post: What Are the Real Issues of Bullying?